This ministry began in America in 1998. Our inspiration to become involved came from Whitburn South Parish Church, who have embraced it and shared it with us. As part of our Prayer Shawl Ministry here at Livingston Old, our two craft groups have knitted and crocheted various items. These are given to anyone in need of comfort and solace, but may also be given in times of celebration and joy. Through these gifts we want to share the all-embracing, unconditional and inclusive love of God in Jesus. 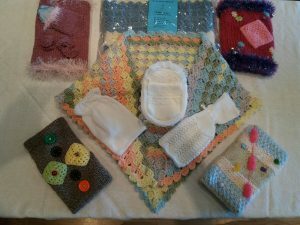 We have made shawls, twiddlemuffs, children’s and baby items, angel gowns and angel cribs. All these items have been given with love and prayers – to individuals, to care homes, to dementia groups, to St John’s Hospital, to SANDS (still-born and neo-natal death’s charity), to a South African orphanage and to KIDS LOVE CLOTHES, a Lothian-wide charity which supports families in dire need. • Do you know of a person or group who would benefit from this ministry of love? • Could you donate to help us continue and expand this ministry? We would be grateful for donations of double-knitting, chunky or white 4-ply yarns. Wool is expensive, so donations of money to buy wool would also be greatly appreciated. • Do you knit or crochet? Do you have time to make items for us? We can supply patterns and yarns from our donated supplies. If you can help in any way, please contact Annette Jamieson on 01506 412020 or use the contact form below.